I feel like a jerk complaining about a little rain when the East Coat is freezing with blizzards. I'm so lulled by the pleasant weather that my wardrobe has no range. I have trouble dressing for wet weather. Most of the time I just pull up my messy wavy hair and throw on a bunch of layers. I've been starting to think about what to wear while I'm in NYC. I'm definitely going to be out of my comfort zone. Luckily, I have a few goodies on my way from Modcloth and Moxie to help me out! i ADORE your style -- simple yet so chic! i love love looove that scarf!! it totally makes the outfit! I agree with Vicky. That scarf just pulls together the entire outfit. You would look chic with a potato sack on as well! :) totally jealous of your NY trip! Take me with you!!! I´m following you, if you to want follow me, i appreciate :)! Just the right touch of romantic... Parisian away from Paris! You are welcome to visit my blog too:)) Kisses! I love your scarf!! Perfect! That's some great layering! I love the coat. And the scarf is really pretty. You are rocking winter style! This is such a cozy spring outfit! Love the hood! I like this short boots a lot, they look great!! I read your little interview the other day, your boyfriend is the sweetest!! Good luck trying to figure out the skill of layering, I've been living in the cold for 4 years now and still too often I don't get it right haha. that scarf is beautiful and i love that jacket! you are so lucky to be going to nyc!! I cannot wait to see the new goodies you are getting for NYC. How exciting! This is one of my favorite outfits!! You look so femenine with an edge.. Plus I need that scarf in my life asap. As always, great post!! Im telling you girl...layers are the way to go right now....I just posted layers layers and more layers. On to march....spring is around the corner. I am totally the same way! In Miami it's already in the 80s so when it gets into the 60s I freeze :) I have like zero winter clothes, so layers it is! Great outfit! Bundle up for NY. you look ready for NYC to me! just add a few more layers and knee high hunters due to the blizzard :) i'd wear this whole outfit out and about in chicago and nyc! This is exactly my style. I LOVE the scarf! It adds that beautiful splash of colour. I just love how a big scarf adds so much luxury, interest and coolness to any outfit - it's that chic layered thing without fussing with too many layers - and you do it really well! Great outfit, loving the scarf, jacket and boots! and of course the wayfarers. I love the big scarf and the bag. I'm all about the layering in these frigid temperatures! In a recent post, I mentioned how I really need to stop complaining about the weather. I mean, it's been warm and sunny all winter here in Mexico with no signs of that changing. 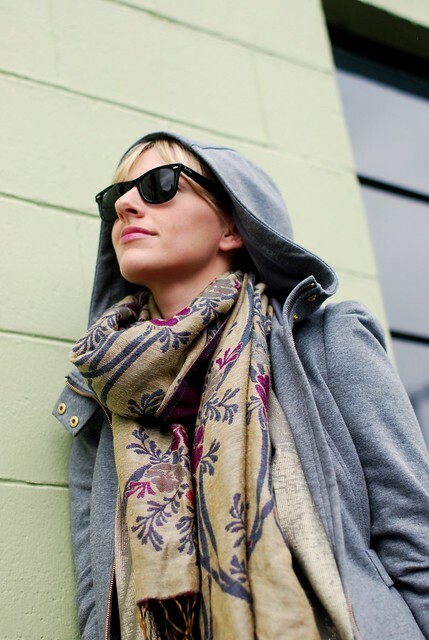 You looks adorably bundled up with the hood on - it perfectly frames your beautiful face! i LOVE, LOVE your coat!!! M.
I know but I can't help but feeling fashion schizophrenic! LOL You look fab yet cozy! The perfect rainy day ensemble! love your wintery outfit and can't wait to see what you put together for NY. am always so jealous of all the california girls and how they can rock bare legs throughout most of the year. it's still icy cold over here in england. Adorable look, loving the added scarf it's a nice pop of colour and oh so pretty! I love how you then added a more edgy boot, nice mix of elements, which work really well together. Haha, love your comment about rain. I live in Vancouver it rains often, I am always perfecting my rain wardrobe! I feel your pain. Taylor, these pictures came out amazing! i love the composition of all of them, and of course, your outfit too. 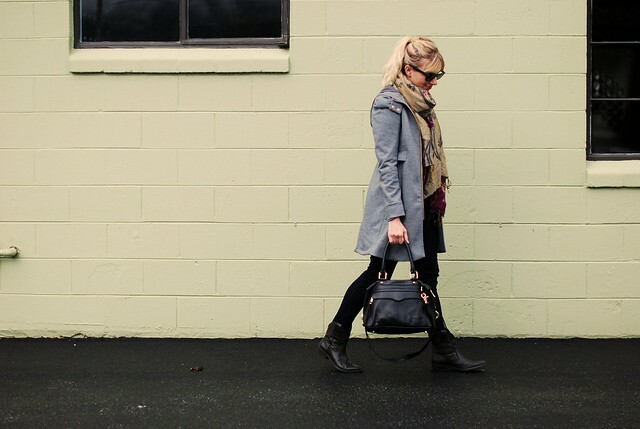 your style here would fit in very well on the chilly east coast. Are you getting amped for NYFW?!! I can't wait for IFB! You are utterly gorgeous in the rain! Love this post! so cute! my favorite part is the scarf! Pretty and chic. Love the layers. Stay warm in NYC! As almost all the other commenter's have said.. I love that scarf. I understand needing layers for cold days! You look so cute and cozy. And yes, the east coast has been facing some crazy weather! Doesn't H&M have the most lovely scarves? I love them and I love your James Jeans. Mine are still on the way as I had some sizing issues, but I chose Twiggy Black Cat, and they are fabulous. I will be wearing them soon hopefully! Thanks again! When in doubt I always layer when it rains, but I did invest in a chic pair of rain boots. Hope all is lovely lady!!!! XO! I would never thought that scarf, blazer, and jacket are from H&M! You really do know how to work it!! I met you at The Neo Trad party last month and have been following your blog ever since; I love how you've been reworking your pieces from your wardrobe. It's definitely inspiring me to do so myself. It was pleased to meet you and I look forward to the Glitter Guide. Ahh I came SO close to buying that H&M jacket last week. Not I really wish I had. I am loving that jacket--great look! beautiful scarf & coat :) i complain about the weather here too, but it's not even that cold. i'm just a wuss! 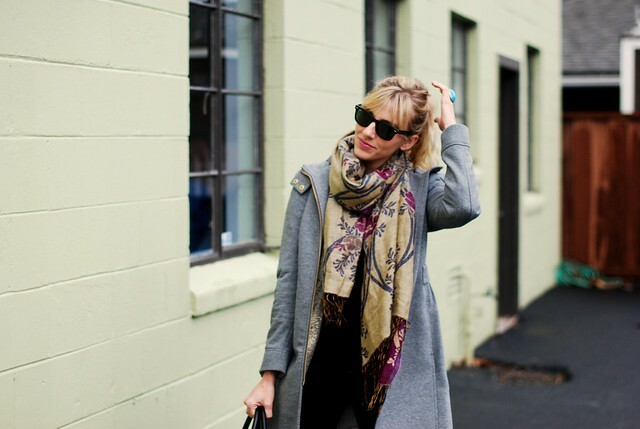 Love the outfit, especially the scarf...reminds me of Anthropology. That is the most perfect coat! I love that it's heather gray, so it looks laid back, but also has a nice structure. I know, you may be a bit chilly in NYC!!! :) Love this look on you though and so excited about those Moxsie boots. PS: Your photographer boyfriend has been doing an awesome job lately!!! I love your bag -- super cute -- and those darling sunglasses! You're pulling this off beautifully. I struggle with cold weather gear so badly. Coats just conjure up bulky and uncomfortable in my mind, but your coat is neither of those! It's really cute and the entire outfit is seamless. I think my fave part is the scarf! Or the boots? NYFW...oh I hope a heatwave hits to melt some of that snow. But whether it does or not you'll find some goodies to put together. Can't wait to see the pics! This is my favorite look. Just relaxed, chic and very wintery. The scarf is stunning. You look so cool! I love the scarf and also the bag! Loving this look! It's so simple and versatile, yet still chic. The Rebecca Minkoff bag is fabulous- love it! This outfit has my name all over it! Love it! Oooh I have that bag in brown and love it. :) Great outfit! I love Rebecca Minkoff her bags are so pretty and practical!